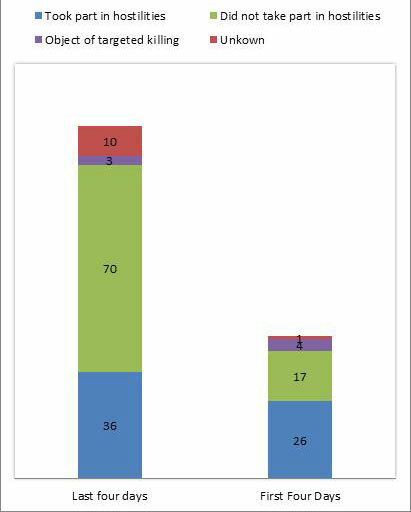 After several months of field research and crosschecking data, human rights organization B’Tselem published a report today (Thursday, 9 May 2013) reviewing harm to civilians in Operation Pillar of Defense. The report provides statistics on the numbers of Palestinians and Israelis killed over the course of the operation, which lasted from 14 to 21 November 2012. The report challenges the common perception in the Israeli public and media that the operation was “surgical” and caused practically no fatalities among uninvolved Palestinian civilians. Furthermore, the report finds that there was a significant difference between the first and the final days of the operation: of the uninvolved Palestinian fatalities, 80% were killed in the last four days of the operation. According to B’Tselem’s investigation, 167 Palestinians were killed by the Israeli military during the operation. This number includes 62 Palestinians who took part in the hostilities and seven other who were targets of assassination. 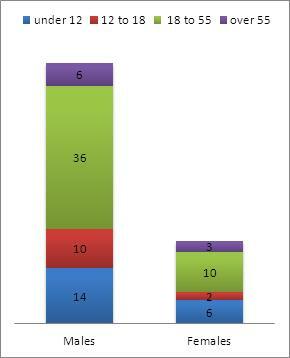 Of the remaining fatalities, 87 did not take part in the hostilities. With regard to 11 fatalities B’Tselem was unable to determine whether or not they had taken part in the hostilities. One Palestinian woman was killed by a Palestinian rocket. A further five Palestinians were killed in two incidents under circumstances that suggest they were hit by Palestinian rockets, but B’Tselem has been unable to confirm this information. Seven other Palestinians were shot to death on the street by Palestinians during the operation. Six of the men had been convicted by the Hamas government of collaboration with Israel. The seventh was still on trial for the same charges. All seven were incarcerated until just before they were killed. Over the course of the operation, four Israeli civilians were killed by rockets or shells fired from the Gaza Strip. Three Israelis were killed on 15 November 2012 when a Grad rocket hit a home in the town of Kiryat Malachi in southern Israel. One was killed on 20 November 2012 by a mortar shell. In addition, two members of the Israeli security forces were killed by mortar shells – one, on 20 November 2012, and the other, who was hit on 21 November 2012, died of his wounds the following day. A breakdown of the figures per day reveals a significant difference between the numbers of uninvolved Palestinian civilians killed in the first and second parts of the operation. Whereas 48 Palestinians were killed in the first four days of the operation, 119 Palestinians – nearly 2.5 times as many – were killed in its last four days. Moreover, during the last four days of the operation, 70 uninvolved Palestinian civilians were killed – more than four times as many as the 17 killed during the first four days. Also significant is the difference between the number of fatalities among Palestinians who took part in the hostilities and those of Palestinians who did not. During the first four days, 1.5 as many Palestinians who took part in the hostilities (26) were killed as were Palestinians who did not. In contrast, over the last four days nearly twice as many Palestinians who did not take part in the hostilities (70) were killed as were Palestinians who did take part in the hostilities (36). Israeli officials emphasized, both during the operation and subsequently, that the harm caused to civilians in the course of the campaign was much less extensive than that caused in Operation Cast Lead. Granted, in Operation Pillar of Defense the Israeli military adopted a stricter open-fire policy and firing was more restricted and focused, especially during the first four days. However, the unprecedented harm caused to Palestinian civilians in Operation Cast Lead cannot serve as a yardstick for determining the legality of the military’s actions during Pillar of Defense. B’Tselem’s report raises suspicions that the military violated International Humanitarian Law (IHL). Breaches of two major aspects of IHL are of greatest concern: lack of effective advance notice of an impending attack and an unacceptably broad definition of what constitutes a “legitimate target”. The report analyzes nine cases in which Palestinian civilians were killed or injured by the military and which raise suspicions of IHL violations. Israeli officials have argued that part of the harm to civilians was justified by the conduct of armed Palestinian groups, which included firing at Israel from locations adjacent to civilian homes and concealing explosives in civilian homes. Nevertheless, although the conduct of the Palestinian groups undeniably creates additional difficulties for the Israeli military, their violations of IHL cannot serve as justification for IHL violations by the Israeli military. Pronouncements made by military officials indicate that current technological capacities enable precise strikes and the gathering of reliable information as to the presence of uninvolved civilians at the target immediately prior to the attack. An explanation is in order, therefore, for the marked rise in the number of uninvolved Palestinians killed in the last four days of the operation – more than four times as many as in the first four days. Did the military change its policy and decide to carry out attacks despite the anticipated injury to uninvolved civilians? B’Tselem has received no answer to these queries. Approximately four months ago, B’Tselem sent the IDF Spokesperson a list of 20 cases, detailing the date, time and location of each event, in which initial investigation raised suspicions of illegal conduct by the military. The military responded only regarding the nine cases detailed in the report, stating that it is aware of eight of them and noting which cases had been closed and which were still under review. No substantial information was provided regarding the allegations in each case. Given the harsh results of the operation and the many questions that remain unanswered, the Israeli military must make the investigative process transparent, provide the rationale for each decision to close an investigation, and enable external and independent criticism of these decisions.